There are certain high-street stores that are so reliable we know we can count on them all year round. H&M is one such source of wonderment: Not only is its swimwear section the go-to for all shapes, sizes and styles this time, but it's also a firm favourite for dresses 365 days of the year. So much so that some of the most stylish of influencers are backing H&M's top new frocks all over Instagram. We, of course, wanted to find our own favourite styles in addition to these blogger-backed options, so we spent the afternoon sifting through all the dresses online (it was exhausting but weirdly therapeutic) to find you the best of the best. The sequinned dress of dreams Lucy Williams is wearing will be your summer soirée/OTT festival/"anywhere you can get away with wearing it" fallback. It's a sneak peek from the new Conscious drop, and considering this picture has already racked up over 13,000 likes, you can imagine how quickly it'll sell out. Add 11 April to your diaries, people. Luckily, the Studio Collection is already out and there's a dress that's still in stock (thank you, fashion gods). It's already loved by Monikh, and aside from the fact that it fits like a dream, it's in one of this season's key prints and costs £80. We can only assume you're adding it to your basket right now. We've got so much passion for the H&M dress section this year that we would actually go as far as to say it's the go-to for printed styles this season. There are iterations that even give designer styles a run for their money. Just take a look at the paisley wrap dress Mary has styled above with a raffia bag and kicks. Those pleats, the cuffs, the flattering V-neck… The other two print options in this silhouette have naturally already sold out online—go, go, go! Scroll down to see and shop our edit of the best H&M dresses. We haven't stopped thinking about it since we spotted it on Monikh. The most elegant day (or night) dress. From a bougie brunch to the races. Floral dress + box-fresh kicks = the spring/summer equation we're sticking to. Just add tan accessories and you're good to go. Polka dots are pretty much essential this season and beyond. Yep, that's the actual price. Just add raffia sandals and a chunky hairband. So simple and effortless. Just stay away from the sangria. Could easily be mistaken for Chloé. This is your wedding guest look sorted. The day dress everyone will be envious of. Just imagine it with a straw bag in one hand and a cocktail in the other. The red floral version has already sold out. Snake print is still firmly on our radar. It's the bridesmaid dress that'll suit all shapes and skin tones. It's so easy to wear it needs minimal styling or accessories. The cost per wear will literally be pennies. It looks so chic on. The cami dress is always a winner in our eyes. Such an amazing colour on all skin tones. 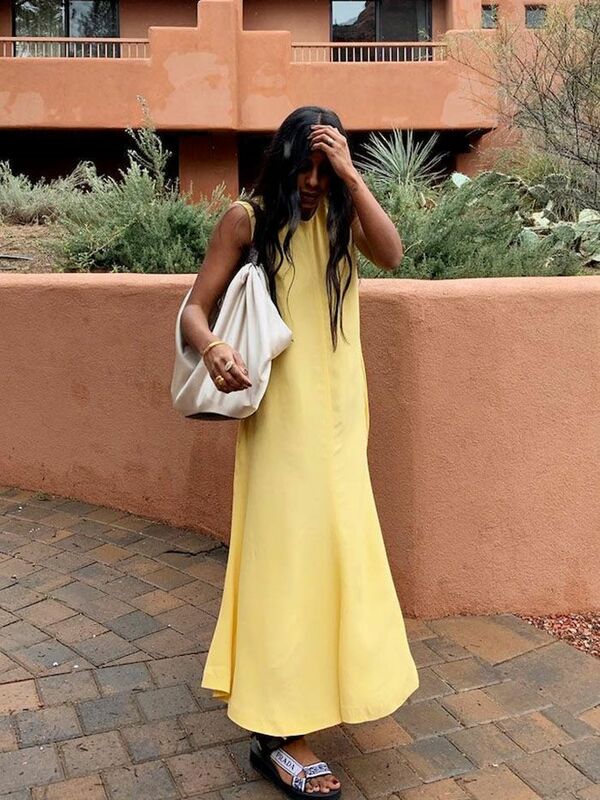 The easy breezy summer dress we all need. It also comes in black and green. Warning: You'll probably want all three. It screams summer, in a great way. The colour, the shape, the fit. Divine. It's one of the few dresses still in stock from the Studio drop. It comes in nine other colours, but we love sunny yellow. Want more dress inspiration? Our expert tells you which frocks to wear for spring.